In 1969, John Deere introduced the custom color line of lawn and garden tractors. They are referred to today by collectors as the Patio series. The marketing people at Horicon felt that not everyone wanted a green and yellow garden tractor. (My personal feeling is that they saw the business they were losing to their competitors.) The 1969 model of the custom color series was painted entirely Dogwood White except for the hood and seat. The customer would choose a color from Patio Red, Sunset Orange, Spruce Blue or April Yellow. The dealer would then attach the hood and seat in the color they had selected. Deere quickly found that painting the entire body Dogwood White was not practical for several reasons. For one, it required a separate paint line to do all the parts in the Patio line and for another, the white engines tended to stain and discolor. When the 1970 model was released, several parts–including the engine, fuel tank and mower attachments linkages ( but not the air cleaner cover on the 140)– were painted black. On the 1969 models, there is no distinction in the type codes to indicate which units were green and which were custom color. 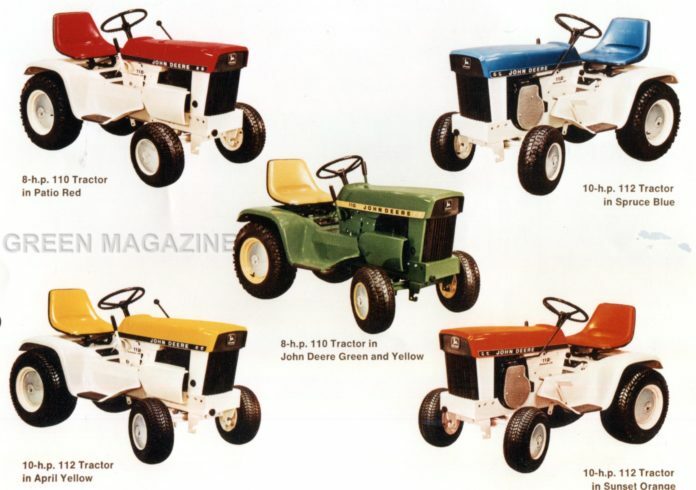 In 1970, they began giving the custom color tractors a different type number so they could be easily identified. Type numbers for 1970-1971 models are: 110 (T0642M, T0648M); 112 (T0654M, T0655M, T0656M, T0658M); 120 (T0658M); and 140 (T0582, T0584M). Sales of the custom color tractors were poor and Deere ended production after the 1971 line. Company officials realized that the guys who bleed green and buy John Deere were not interested in a red, blue, yellow or orange garden tractor. Many dealers had to paint their remaining units green to even sell them. Often during a restoration today, collectors will discover there is white paint under the green on their 1971 (or even 1970) garden tractor. Check your serial number to see what your model originally was! The most common question I get about the Patios is, “Where can I get an original seat?” The answer is, ”That’s a GOOD question!” They rarely show up on Ebay anymore. Occasionally, someone tells me they find one or two NOS (new old stock) in a dusty back corner at a dealership. Sometimes a dealer or former employee will have used a set of the four seats as bar stools, but even those are disappearing as word of the hobby spreads. To my knowledge, no one (including HAPCO) is currently manufacturing replacements. If you DO find one, don’t expect to get it cheap. They are usually the priciest part of the restoration! Check the classifieds in Green Magazine or LGT News. We rarely get ads for a NOS Patio seat, but sometimes see good, used ones come up for sale or trade. If the seat you do have is in fairly good condition, you might be able to paint it, dye it or have it recovered. The second question I get is, “How can I tell a yellow Patio seat from a regular yellow seat?” The answer to that one is easy. The Patio line seats had a very distinctive texture on the seat base or back side of the seat. Some serious Patio collectors claim that the April Yellow seats were much lighter yellow, but I haven’t seen them together to really compare. The third most frequently asked question is, “Why did they choose THOSE colors?” The answer depends on who you ask. Most dealers feel it was to keep up with the competition. Is it a coincidence that the colors match those of IH Cub Cadet, Massey, Ford, Allis Chalmers, Simplicity, etc.? While researching this article, that is the most common answer I got. But several people told me they heard that the marketing people at Horicon looked out in the parking lot at the most popular car colors of the period and decided women would buy a mower in that color also. When I first heard that one, I thought, rdquo;Who would want a YELLOW or ORANGE car?” But then I realized that we had a new YELLOW Buick GS 350 when we married in 1971 and my brother-in-law had both an orange car AND truck at that same time! So maybe there IS something to that theory! And in studying the sales literature and the magazine ads from those years, it is true that John Deere was marketing the Custom Color line to women. The small 69-2 literature piece introducing the Custom Color line says, ”So you can match your new tractor to your house, boat, car, lawn furniture, etc….even let your wife pick her favorite color…and make sure every neighbor on the street won’t have a tractor that looks just like yours!” A 1969 Life magazine full page ad shows a man spraying the hood of his 112 orange to match his wife’s outfit. The line says, ”There’s an easier way to get her favorite color. 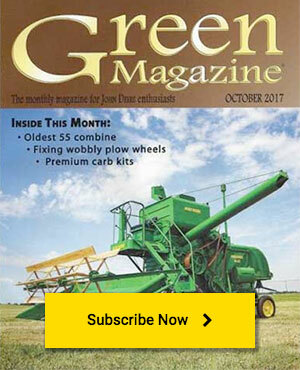 It’s called Custom Color–John Deere’s way of remembering your wife at tractor-buying time. Let her choose from: Sunset orange. Patio red. Spruce blue. April yellow. Or John Deere green. Her favorite color is available on 8-, 10-, 12- and 14-h.p. Weekend Freedom Machines. (YOU choose the horsepower!) Your John Deere dealer is listed in the Yellow Pages. See him soon. And take your wife along.” I won’t tell you how I feel about the “YOU choose the horsepower” line, but I will remind you that I AM a woman, I collect garden tractors and the powerful 140 is my favorite! The questions I get lately are, “Why are they called Patio tractors now?” and “Did John Deere ever refer to them as the Patios in its advertising?” I have been unable to locate anything that would indicate that John Deere ever called them the Patio line in its ads or sales literature. Most of the “experts” I spoke with said they all believe (as I do) that the name came from the Patio Red color. It would be easier to say, “I have a new Blue Patio,” than to say “I have a new Spruce Blue Custom Color.” The term ”Patio” just seems more casual and comfortable to use. Regardless of what John Deere called them officially, they are definitely referred to as “the Patios” by collectors now. Because the original paint was lead based and that is no longer legal, the colors are affected slightly, especially the Dogwood White. The first set of colors was used by Shelly Rowell on her wonderfully restored Patio set that many of you have seen at various shows over the years. The second was made by a Dupont dealer making a computer color match. We haven’t restored a Patio yet, so I have no personal experience with the color variations, but I received several complaints from people who said they used the second set of colors which someone got out of a copy of my Little G Newsletter. They were very upset because they felt several of the colors were off and the white was “the color of snow or a refrigerator!” I told them what I am stating here. I have NEVER published any paint codes in my newsletter and I haven’t used any of the Patio paints. Before you paint YOUR Patio tractor, do some research and talk to other collectors. Find a restored Patio you like and ask the owner where he got the paint and exactly what code she or he used. Next articleAsk Mr. Thinker – 4010LP with 1000 RPM PTO Shaft?